The knapsack problem is an NP-complete problem where given a certain value for capacity and weighted items of different values , to determine whether or not there exists a subset of the items for which the sum of its values is equal to that of the capacity. In mathematics, there exists a class of complex mathematical problems, known as NP-complete problems, where there are no efficient algorithms to solve these problems other than exhaustive search of trying all the possible solutions one at a time and determining whether or not they are actually solutions. Bacterial computers offer a more efficient alternative approach to solving these NP-complete problems. By engineering a Bacterial computer, the millions of cells can simultaneously try the possible solutions and determine whether they are in fact a solution to the given problem. Even cells with identical genes can produce different levels of protein. This variation is called noise. While noise is generally treated as a necessary evil in synthetic biology, we chose to use the stochastic nature of gene expression to our advantage. The combination of the tetA gene and an environment containing the antibiotic tetracycline creates a natural band pass filter. The tetA gene provides a level of resistance to tetracycline by creating efflux pumps that help the cell excrete the otherwise fatal tetracycline. However, these pumps come with a cost. They make the cell membrane more porous and permeable. With too many pumps, the cell cannot maintain homeostasis and dies; with too few pumps, the cells cannot remove tetracycline from its cytoplasm and dies from blocked protein synthesis. With this band pass filter in mind, we decided to make the cell itself the knapsack. Overexpression of tetA would be analogous to exceeding the capacity of the knapsack. However, this decision left us with a fundamental problem: weights. 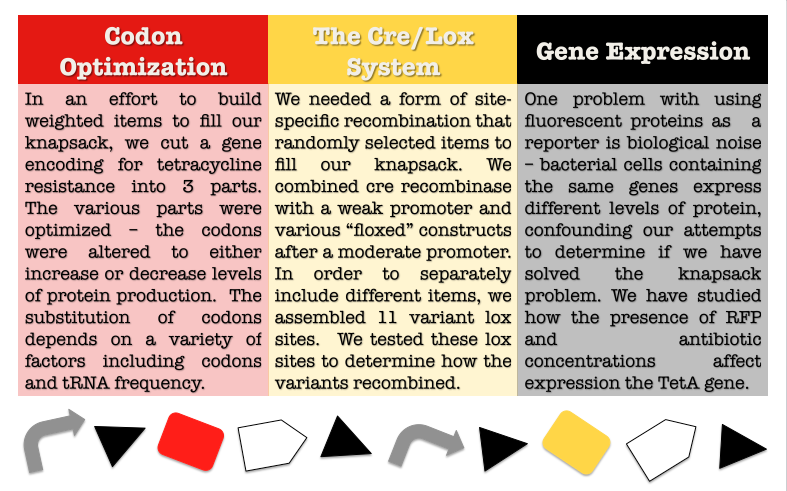 We used a novel tool called codon optimization to assign weights. By rewriting the codons of the gene itself to more closely match the available tRNAs, we could theoretically increase how many pumps were produced by different versions of the same gene in a given time frame. We planned to create a chain of these modules with a different fluorescence attached to each one to act as reporters. Each tetA and fluorescent color pair would be attached to a kind of genetic switch in the form of the Cre/lox system. A switch being on would correspond to packing an item of that weight into the knapsack. Allowing this system to run and randomly flip switches on and off would ensure that all possible combinations of packed knapsacks would be generated. The TetA band pass filter could give us a narrow subsets of cells that solved the problem. We could then figure out how a cell packed the knapsack based on the fluorescent reporters.